In order to understand how training works, first consider what happens to your body during an intense workout. When you exercise vigorously, your metabolism increases, raising your internal temperature. Your body draws on the fuel it stores in your muscles: glucose and adenosine triphosphate (ATP). But your fuel supplies are limited, and your bodys cells soon need to make more, for which they need extra oxygen. Thats why you start breathing harder. The additional oxygen reaches your muscles through your blood, so your heart pumps faster in order to get more blood out to the muscles. If the exercise is truly vigorous, then the additional oxygen youre taking in is unlikely to keep up with demand, and your muscles begin to make lactic acid. Lactic acid functions as a secondary fuel, but its not a very efficient one, and it builds up in the tissues and creates a burning sensation. Finally, the stress you put on your muscles and bones begins to make minor damage in the tissue, and thats all to the good. Whats clear in these two scenarios is that exercising is a process of tearing down, while recovery is a process of building up. If you think recovery only exists so you can get out there for another workout, you have it exactly backward. Recovery is the whole point of training. Exercise doesnt build you up or improve your performance. It only runs you down so you need to heal. Its the healing that builds you up and improves your performance. You cant have recovery without exercise, but many athletes forget the corollary: you cant have exercise without recovery. Recovery requires just as much planning and care as the exercise that makes it necessary. So plan on spending your next rest day resting, and stop feeling like a criminal if you take a nap or sit around with your feet up. 1. 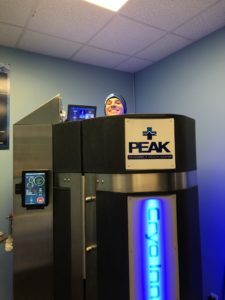 Cryotherapy rejuvenates muscles at the cellular level by reducing inflammation and swelling. It has been shown to accelerate recovery during a program of high-intensity intermittent exercise. 2. Photobiomodulation relieves oxidative stress and promotes the cellular production of ATP. It has been shown to reduce blood lactate levels and perceived fatigue. 3. Compression therapy flushes toxins from the blood and prevents blood pooling. It has been shown to enhance recovery after the kind of training sessions performed by Olympic athletes. 4. Infrared sauna cleanses at a cellular level by melting the fat bound to toxins, which are then flushed out through perspiration. It has been shown to help the neuromuscular system to recover from maximal endurance performance. 5. Flotation REST (an acronym for restricted environmental stimulation therapy) increases mental focus by temporarily restricting mental and physical stimulation. It also happens to be one of the most profound and deepest forms of rest you can enjoy above ground. All of these technologies are available at our Nashua facility, Peak Recovery & Health Center. If youre an athlete, taking advantage of these technologies will allow you to train harder, more often, and injury free. Let us help you plan your recovery and improve your performance. Spend part of your next rest day with us. Check out our website for more in-depth explanations of how one or more of these technologies can help make you the athlete you want to be. ← Be positive!!! Give energy!! !